Background: In recent years, there has been a growing interest in the environmental relevance of the presence of several pharmaceutical compounds and their metabolites in water. To avoid further accumulation of these compounds and their metabolites in the aquatic environment, several research groups are investigating chemical and photochemical methods that could be applied in their destruction and subsequent removal from natural and wastewater. Objective & Method: Different chemical advanced oxidation processes are being developed to destroy organic pollutants in water. Most of these methods are based on the production of HO• radicals that are known to be highly reactive and strong oxidizing agents. In aqueous chemical processes, these radicals can be generated using a variety of reagents and under different reaction conditions such as O3, H2O2/UV, TiO2/UV, O3/UV, H2O2/Fe2+, H2O2/Fe2+/UV and O3/Fe2+/Cu2+/UV. This review is a survey on recent advances in the application of different chemical advanced oxidation processes to mineralize pharmaceuticals. Paracetamol was selected as a model compound since its structure is the main component or metabolite of several anesthetic and analgesic compounds. 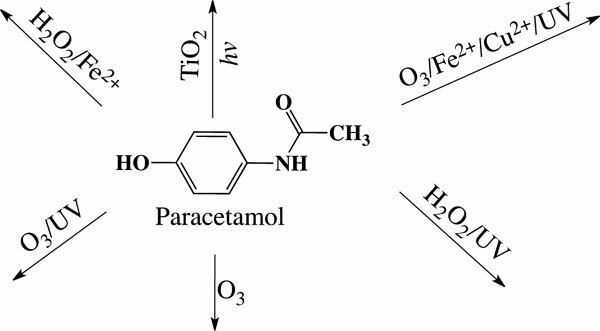 The degradation of paracetamol by different advanced oxidation methods has been investigated by a combination of techniques (TOC, UV-Vis, IR, HPLC and GC-MS) in order to determine the optimal reaction conditions, kinetics, intermediate and product compounds generated. Conclusion: Understanding the basic concepts about reaction conditions, intermediates and mechanistic details on mineralization of paracetamol will be quite useful for future applications of several techniques in the removal of this and other structurally related pharmaceutical and aromatic compounds from water. Paracetamol, ozonolysis, Fenton, photo-Fenton, TiO2-photocatalysis, pharmaceutical compounds, aromatic compounds.